What is Pure Food and Wine? Last night I unexpectedly found myself dining at Pure Food and Wine. Although I’d passed by there dozens of times, the idea of eating “Raw” Vegetarian cuisine never seemed too appealing. But to my surprise, I had a fabulous dining experience. Pure Food and Wine considers themselves New York’s premier “raw foods” restaurant, utilizing organic seasonal fruits, vegetables, nuts, and seeds to create a unique, award-winning experience (and yes this was directly taken from their website). Pure Food and Wine classifies “raw” as keeping all of the ingredients under 118 degrees. Apparently this preserves food’s natural enzymes which catalyze digestions. Wheat, dairy, soy, and refined sugars are naturally omitted in raw food preparation. Pure Food and Wine’s website even sells the book “Raw Food Real World” for people seeking more information about the “raw” lifestyle. This site clearly does not do the restaurant justice. The words raw and vegetarian completely turn me off and I’m sure that most discerning New York diners feel the same way. But don’t be fooled by their lack of protein packed dishes. Pure Food and Wine’s “raw” plates tantalize the senses in a way you’d never expect from a vegetable. Unfortunately I did not bring my camera with me last night so you’ll have to use your imagination. We began our night with a few glasses of wine at the bar. The bartender was incredibly knowledgeable and helped us make our selections with a few tastings. After trying the Malbec and the Zinfandel, I went with the Malbec and my friend chose the Cote Du Rohn, which were both very tasty. The Malbec was incredibly smooth and maybe one of the best I’ve had to date. The bartender was nice enough to serve us a complimentary variety of olives bathed in fresh herbs, pickled onions, and olive oil which enhanced the flavor of the wine. I have to say that all three dishes exceeded our expectations. We started with the Winter Salad which had a great mix of ingredients. The saltiness of the cheese perfectly complimented the sweetness of the apples and candied walnuts. We then dabbled with the playful cheese plate. This stunning dish had a variety of three hard and soft cheeses accompanied by honeycombs, lingonberries, and a puree of what tasted like apple and horseradish. We experimented by creating different combinations of salty cheeses and fruity compotes, each with its own unique flavor. Our final dish was the Zucchini Lasagna. Although the waiter had mentioned that the lasagna was Pure Food and Wine’s signature dish, I wasn’t expecting anything out of the ordinary. But when the $26 lasagna was brought to our table I couldn’t believe my eyes. Between the raw glistening red and yellow tomatoes and the bright green color of the zucchini, I thought twice before going ahead and piercing it with my fork. The lasagna was quite a vision, adorned in red and green. I’ve never really seen lasagna that wasn’t dosed in heavy mozzarella cheese and think processed sauce. But I quickly dismissed its aesthetic nature and dove right in. It was just as heavenly as it appeared and i savored every bite. The blend of pignoli, ricotta, pesto, and sun dried tomatoes was truly harmonious. After the lasagna, I was too satisfied to have anything more. Although we skipped dessert, I’ll most definitely be returning for another Pure Food and Wine experience. 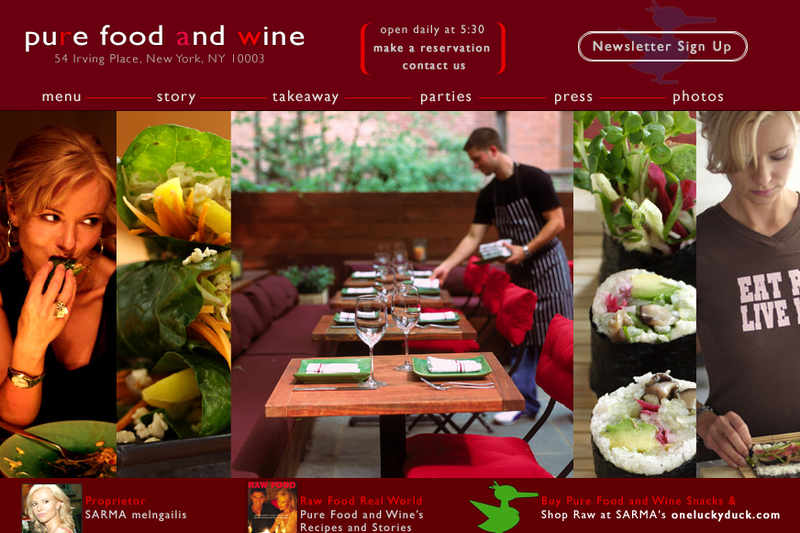 If you can bear the raw and vegetarian vibe, or are even willing to try, I would take a trip over to Pure Food and Wine. It might surprise you.